In a medium saucepan, cook orzo pasta per package directions, about 10 minutes. Mix cooked orzo with parsley, 1 tbsp dill, half the cucumber, cherry tomatoes, half the garlic, scallions, red onion, garlic, lemon juice and a tablespoon of olive oil in a large bowl. Add 1 tsp kosher salt and 1/2 pepper to taste. Set aside. Next, heat a cast iron or non stick skillet over medium-high heat, add 2 tablespoons olive oil and butter. Season salmon with salt and pepper on both sides and cook for about 4 minutes on each side till both sides are brown and crispy. 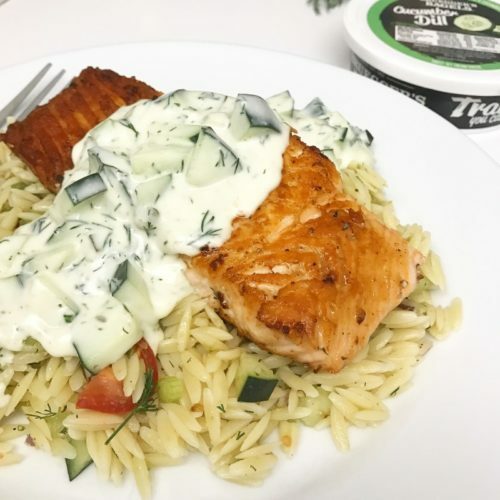 While salmon is cooking mix half and half with the Bruegger’s Cucumber Dill cream cheese in a small saucepan under medium heat. When cream cheese has melted and combined with half and half, add the remaining cucumber, dill, garlic and mix. Recipe by Agnes of Spoons and Stilettos blog.